So that little episode with Boadicea the Victorious’ Complex left me in a bit of a weird mood and what better way to usher out the smell of smoked roadkill than a Paris Hilton perfume? I kid. Paris’ perfumes are not bad. They are great hallmarks of what modern (as of this writing) feminine celebrity perfume is all about, fun, fruits, and not a care in the world. In Bottle: Aquatic, sweet fruity scent with a bit of florals. Nothing groundbreaking, but it smells nice and is easily wearable. Applied: Sweet and fruity up top with a very mild hint of gardenia layered over a giant bowl of peaches and assorted fruitery (I am making up words, leave me alone). There’s so very little I can say about celebrity perfumes like this, they all hit the same note eventually and that same note is during the mid-stage where the fragrance tends to nosedive into this very repetitive fruity floral mix that I can describe over and over again but ultimately it ends up the same way each time. It’s clean, it’s sweet, it’s girly, it’s fun, fruity and flowery. Oh yes, and it smells pleasant, of course. Fairy Dust dries down with a blend of clean patchouli, clean musk, and creamy vanilla. Extra: So I, like many people probably, wondered what in the heck “Prosecco” was. A quick Googling reveals that it’s a white wine. I don’t drink wine very much anymore but hey, the more you know! Now Smell This has a bit more about the Prosecco accord. Design: Like the designs of most of Paris Hilton’s perfume line, I find this one way too young or too far out of my tastes. The bottle has a turquois nozzle, the glass has a fairy on it–Okay, I’m going to come out and be honest with everyone now–I hate fairies. I do. I hate the insipid little imaginary things. I imagine that if they were real, they’d constantly be buzzing around my head giggling and sprinkling their fairy dandruff all over me. So every time a new fragrance comes out with a winged little fairy on it, I go a little mad. So like I was saying, there’s a fairy on the glass, the entire design is very young and yet strangely minimal at the same time. Minimalism works best when you go all out on it, I think. Doing it half-here and half-there only serves to make the design look incomplete or cheap. Sorry, I just don’t like the look of this packaging–and it’s not just the fairy. Notes: Prosecco accord, pink peony, orange blossom, spring gardenia, water lily, peach nectar, sueded patchouli, cashmere musk, vanilla cream. People have likened this to smelling like Juicy Couture (original) and I can see where that comes from. There’s a more fruity personality to Fairy Dust though that makes it hit a younger vibe than original Juicy Couture. I also, and call me out if I’m just crazy here, noted the lack of tuberose in Fairy Dust. I prefer Juicy Couture though Fairy Dust is a decent fragrance too–I just love me some tuberose. 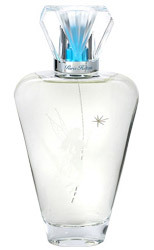 Reviewed in This Post: Fairy Dust, 2008, Eau de Parfum. This entry was posted in floral, fruity, Reviews By House, spin off and tagged cashmere musk, orange blossom, peach nectar, pink peony, prosecco accord, spring gardenia, sueded patchouli, vanilla cream, water lily. Bookmark the permalink.